– Austrasse, that's in my neighborhood! – Wettstein, I know where that is! – The river is almost complete. 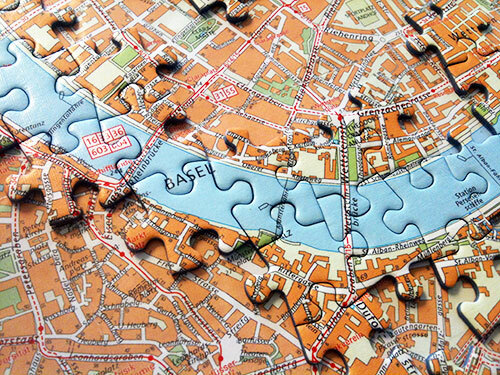 We set up a thousand-piece Basel city map puzzle at one of the desks at Magnolia. (Yes, we sometimes work too.) The puzzle is made by Helvetiq, the company that makes the trivia quiz game of the same name. It turns out that a puzzle is a great way to learn about your co-workers. This is useful if you have lots of new staff like at Magnolia. People walk by the desk and solve a piece here, another there, explaining where they live and how they know the city. I can't imagine a better ice breaker.